Turenne is a 13th century village with a imposing chateau. 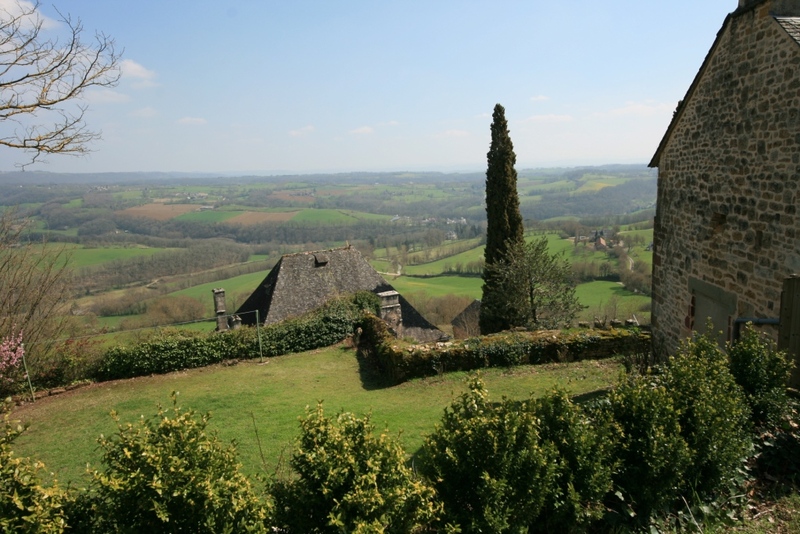 Set in the Corrèze department in the Limousin region in central France. It is perched high on a cliff and has outstanding views across the valley. 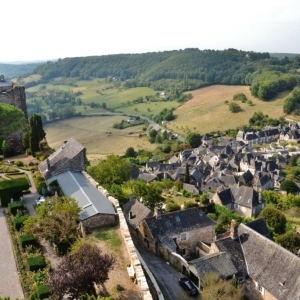 The town is classified as a “les plus beaux village de France” (one of the most beautiful villages of France). The town became a absolute feudal state after the Crusades and one of the great fiefs of France in the 14th century. From the Middle Ages to the 18th century, the viscount of Turenne ruled complete autonomy. Until 1738 the sheriffs, despite honoring the French king with simple gifts, were free of taxation and acted as true sovereigns; producing their own currency, controlling taxes, convening the Estates General and governing the people, in essence the Viscounty formed a state within a state. When it was at its peak in the 15th century the fiefdom spanned from Meymac or Lapleau in the north-east, Terrasson to the west, and Gramat to the south. At that time, the major fortified cities belonging to the Viscount were Argentat, Servieres, Beaulieu, Gagnac, Martel, Saint-Cere, and Turenne; other walled cities included the bastides of Bretenoux and Puybrun, the cities of Carennac, Vayrac, Curemonte, Meyssac, and Collonges. The powerful Viscounty lasted until the Reformation. By this time Calvinism was being spread by the boatmen of the Dordogne throughout the region. In 1575 Henri de la Tour engaged with Henri of Navarre and Turenne became a hotbed of religious and civil wars. On 8 June 1738, Turenne was sold to Louis XV to pay the gambling debts of Charles Godfrey, the last of the Viscounts of La Tour d’Auvergne family. This ended the independence of this last French stronghold. The Viscounty’s subjects became subjects of Louis XV and were forced to pay taxes. The king also ordered the dismantling of the fortress of Turenne. 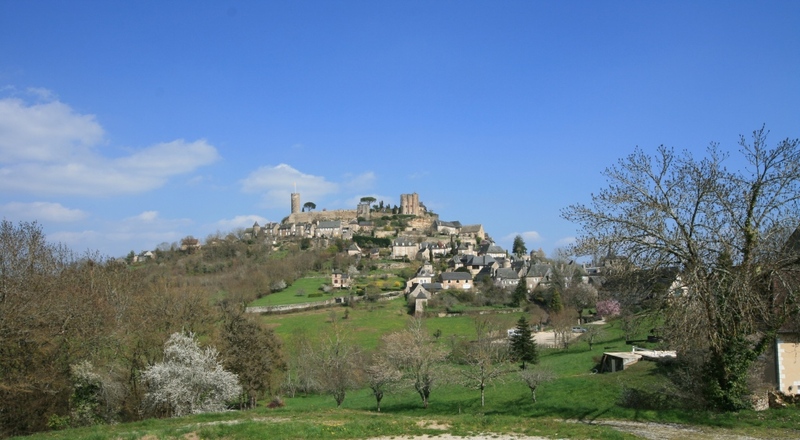 By the time of the French Revolution, Turenne had become a seat of a royal provost. 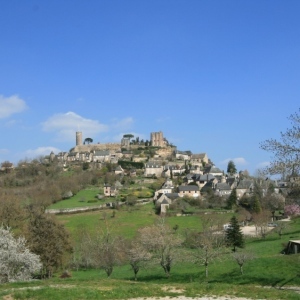 Now Turenne is a pretty village that attracts many tourists and visitors during the summer months. The hike to the chateau is steep but well worth the effort for the remarkable views. The Tower of Cesar sits at pride of place at the top of the chateau and dates from the 12th century. Calvary Tower which was also part of the defences. The Church of Notre-Dame is the most important religious monument in Turenne and was built in the 17th century and contains an impressive altarpiece. The village with houses from the 13th through the 17th centuries is a pleasure to meander through. 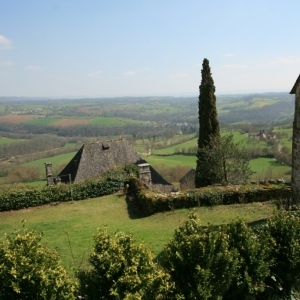 From the top of the village there are commanding views across the valley and it is well worth the walk up.